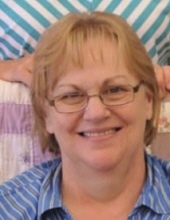 Connie Sue Haddix, 64 of Petersburg, KY passed away February 3, 2019. Connie was born June 1, 1954 to Everett Barnes and Zula Hargis. She was retired from Conner High School in Hebron, KY as a cafeteria cook, was a member of Belleview Baptist Church in Belleview (Boone County), KY, and loved baking and especially loved her grandbabies. She is preceded in death by her parents and 3 Siblings Onvie Barnes, Ola Johnson, and David Barnes. She is survived by 3 Children Tina (Ron) Griffith, Sherri (Steve) Lilly, and James (Danette) Haddix, 6 Grandchildren Kyla, Jeremiah, Summer, Sawyer, Cora, and Roman, 6 Siblings Virginia Feldhaus, James Barnes, Carmon Barnes, Maxine Moore, Sherman Barnes, and Charlene Hubbard, and numerous Nieces & Nephews. To send flowers or a remembrance gift to the family of CONNIE SUE HADDIX, please visit our Tribute Store. "Email Address" would like to share the life celebration of CONNIE SUE HADDIX. Click on the "link" to go to share a favorite memory or leave a condolence message for the family.